Llanddona Beach is bit of a nervous adventure to get to, but when you do get here, it is satisfaction realised. It's a natural, long and spacious haven that is ideal for family fun, a dip in the sea, windsurfing, kite-surfing and quality sea-fishing. Set against the backdrop of the lush green eastern peninsula of Llanddona it offers and provides you with a beautiful beach day experience. By the way, what's your driving like? Could be important. 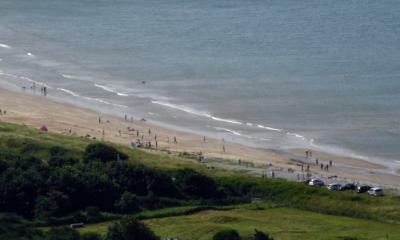 Llanddona Beach regularly draws back those visitors who know about it from long distances. Llanddona Beach and WHITE BEACH around the hill behind you are ideal sea-fishing beaches. Anglesey is obviously an island. That means that if the conditions on one coast do not suit sea fishing, surfing, windsurfing or kite-surfing, then simply choose another. 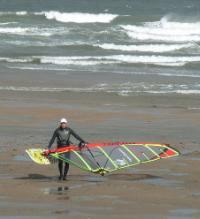 After a few days of clean good north-easterlies or north-westerlies, then conditions are perfect for windsurfing and kite-surfing. Long, long stretches keep you going 'til you drop, totally stoked and evangelical about the perfect conditions. You feel like you can go on forever. Believe me, I did not want to leave. When you arrive at village of Llanddona you’ve completed the straightforward part of your journey down to the beach. It's downhill from here. Quite literally and quite steeply, whether you choose to go right or left. Of course, There are passing spaces. But I can guarantee you that every time you face oncoming traffic there won’t be a passing space in sight. When you arrive at Llanddona Beach - and before you all rush out to start your beach day - find the little snack café. Change your sweat-soaked t-shirt and grab a cup of tea. Pause a long moment to listen to your heart slow down to a gallop. Then, and only then, buy the kids an Anglesey Ice-Cream. My favourite is blackcurrant with cream and a flake. DON'T PANIC - YOU CAN DO IT! You know as well as I do that people tend to stick to the tried and tested beaches because they are happy and content there. And what's wrong with that? It's your holiday after all. 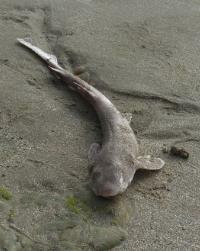 But why not seek out one of those Anglesey beach gems that are just a little bit awkward to get to? That's Llanddona Beach for you- without any doubt whatsoever. Llanddona Beach is well worth the vehicular orienteering adventure to get to. It may well be along narrow, windy roads and then down the steepest hills on Anglesey (25% or 35% - you choose). HEY! Don't you like a challenge? There again, you could always hitch yourself to Shank's Pony and walk around the large Red Wharf Bay on the Isle of Anglesey Coastal Path? Quite naturally, you'd perform this task better after a meal at the Ship Inn or the Old Boathouse cafe/restaurant in Red Wharf Bay, of course. IS LLANDDONA YOUR FAVOURITE BEACH? Is this your favourite Anglesey beach? Maybe you've enjoyed bathing, walking or generally been blown about here? If you've got stories or thoughts you'd like to share about this or any other Anglesey beach with other visitors then please CLICK HERE. Up the coast from Llanddona Beach is Benllech (a traditonal small British holiday beach village) and directly opposite is the very small hamlet of Red Wharf Bay. The excellent news about that little hamlet is that it has the lovely Old Boathouse Cafe Restaurant and Mediterranean Restaurant and the gastro pub called ‘The Ship Inn’. Make sure you visit one or both. The Ship Inn is very popular in Summer and ideal for that wintry evening in front of a big fire, drink in hand and mulling over pleasant thoughts. The Old Boathouse Cafe-Restaurant and Mediterranean Restaurant with its tabled patio offers you a quality experience with pretty decent menus (open from 10:00am onwards). I commend both for your inspection and assured approval. Send out your sight northward from Llanddona Beach. The last piece of Anglesey in the distance is Point Linus off the village of Llaneilian near Amlwch. Cetacean Watchers seek out dolphins and porpoise from the Point Linus lighthouse. It also has excellent marks for the fisherpersons among you. There's a lovely Anglesey Coastal Path route toward Point Linus from Llys Dulas beyond Dulas and Traeth yr Ora beaches. This pleasant journey will take you along beautiful rolling coastal countryside and in full sight of thieving seals at high tide. Have a look at it by CLICKING HERE. Now draw your sight back about half the distance. You should be able to see the village of MOELFRE gathered near the sea. This is where the Royal Charter went down 26 October 1859 in a 104 mile an hour hurricane. 452 lives were lost. Off Moelfre lies a coastline where the men of the local RNLI Lifeboat Station have performed countless astonishing acts of heroism in unimaginable sea conditions. The late Coxswain Richard 'Dic' Evans stands out as a giant among giants. I think that these men are my real heroes. Ordinary men who regularly perform astounding feats of courage in Britain's worst seas. As you sit in the soft sand of Llanddona Beach, contemplate the beauty all about you and reflect that Nature offers bounty and terror in equal measure. 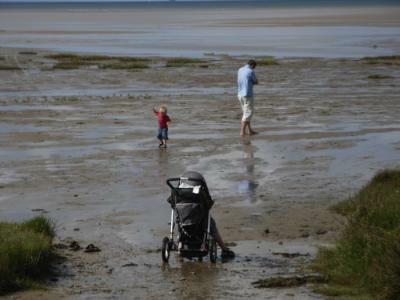 Reports for sea-fishing on Llanddona are varied and it appears that many people seem to enjoy the fishing at Red Wharf Bay and White Beach a bit more. 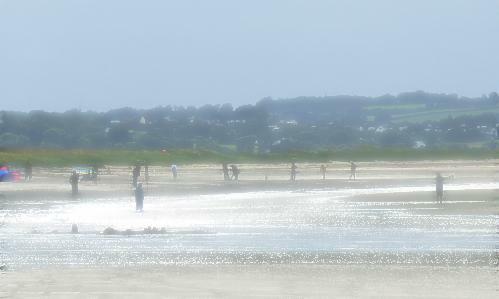 Apparently, the fishing off Llanddona Beach is best on the right - the last 200 metres. Too blinkin' often do you come down to Llanddona in the morning and find dead doggies strewn along the beach by frustrated anglers. Be nice. They gave you a good fight. Chuck the buggers back in. 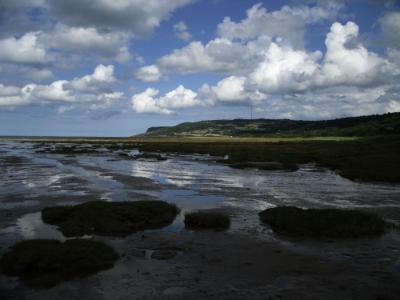 At Red Wharf Bay you are best guided to the left of the village to the gullies. Best results are earned from night fishing. As elsewhere the wind conditions dictate the species and quality of your catch. You'll have a bit of difficulty finding WHITE BEACH, but once you know the route there from Llansadwrn near Beaumaris you'll never forget it. 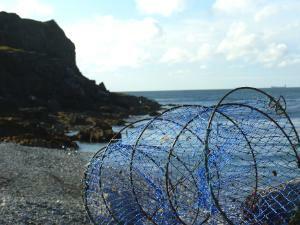 Here you can either fish off the pebble-strewn beach and lose a fair bit of tackle or off the vertical rock outcrop. It's the outcrop that draws most fisher-persons because it's a vertical drop. In other words, the ratio of fish to lost tackle is more favourable. SAFETY WARNING Fishing is a brilliant sport but no fish is worth popping your clogs for. This is a very isolated beach so tell someone where you are and when you'll be back. Trust me, the local rag is an embarrasment to have your name, age and starsign quoted in. We call it the 'Daily Death' because the front page is invariably preoccupied with just that - in lurid and shameless detail. A good north-westerly wind makes Llanddona Beach a gem. Off-season it can be deserted. Except for you, that is. Ideal for trying out those moves without an audience bent-double at your antics. It's a pretty long walk to the water when tide's out, so this'll add to your overall fitness. 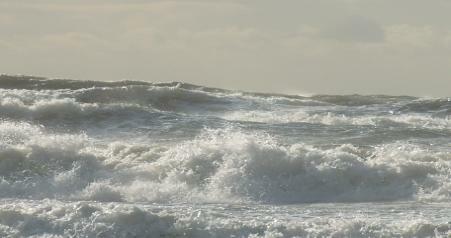 As Llanddona Beach is a north easterly facing beach on the whole you'll find the best wind is on-shore. Let the wind blow for a couple of days and you'll find yourself in heaven with decent sized waves to add to the general excitement. That's mayhem, if you're a novice. Let me perfectly honest with you right now. The best windsurfing and kite-surfing beach on the east side of Anglesey is at LLIGWY BEACH (beyond Moelfre and well worth an inspection). Lligwy is where the big boys and lovely lasses head for when a north, north easterly winds have been blowing for a few days. Llanddona beach generates enthusiastic reports, though it's board surfing standing is pretty low. For the better surfing conditions best head for Anglesey's West Coast beaches at ABERFFRAW, CABLE BAY, RHOSNEIGR, SILVER BAY and TREARDDUR BAY. I am a great believer in the truth and stating what it is that you want from life. Sometimes you need a little help - some divine intervention, perhaps. I've learned that it pays to have more than one MODUS OPERANDI. If one contingency doesn't work, then you have another to hand. When I'm on any Anglesey beach, including Llanddona Beach, and a profound desire strikes me, then I pick-a-stick and write the thought or desire in the sand to allow the sea to carry it to the world to be brought back fulfilled. This all works on the same general principle as Tibetan Prayer Flags. It's a theory under development, but it's got great potential. I'm sure you'll agree that Llanddona Beach is an excellent beach for carrying out these profound experiments. There again, you could always just tell the person. 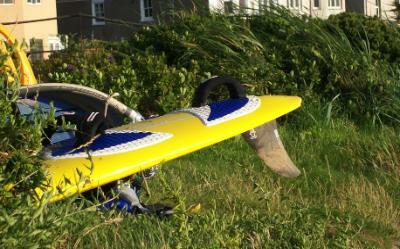 I talked to the Llanddona Beach wardens recently and enquired about anyone launching their powered craft from the beach. It was no surprise really to learn that this 2009 Summer he's only seen one boat being launched off the beach. On High Summer days and busy weekends driving down the hill to the beach can be a driving nightmare just for an ordinary car. Tag on a trailer and you are potentially entering a whole world of trouble. If the oncoming traffic doesn't trap you, then some of the bends most certainly will. 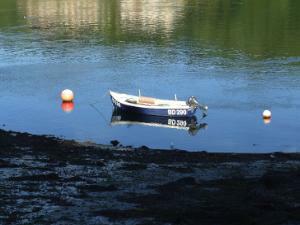 Most boats in the larger Red Wharf Bay have been launched from TRAETH BYCHAN (north of Benllech as you look up the coast). However, the County Council requires you to register powerboats over a certain horsepower and also lists the required qualifications. Do you have any questions you'd like to ask? Visitors to these pages would love to hear from you. Maybe you have questions you want to ask in advance of your visit? We'd all love to hear from you. Please feel free to share. 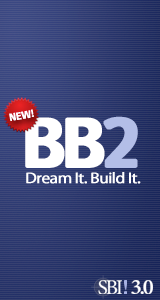 ASK YOUR QUESTION by CLICKING HERE. Llanddona Beach. Well-maintained County Council toilet in the free car park. Car Park about half way along the beach. By the excellent little food stand. 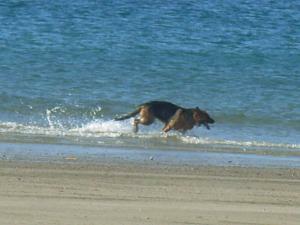 • there are Seasonal Prohibitions On Dogs on certain Anglesey beaches, including Llanddona. That means that between May 1st and September 30th you can't bring dogs onto the beach. Llanddona Beach is another of Anglesey's more isolated beaches, so you'll have to travel a few miles to Beaumaris and Menai Bridge for decent eating and shopping. 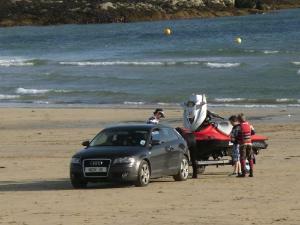 You shouldn't feel that you need to bring absolutely everything with you in the car when you come to Anglesey. Think about your Carbon Footprint. Just bring yourself. Everything you need for your visit you can buy on Anglesey. Not only do we have big supermarkets we have plenty of country shops and post offices that will sell you everything, from stamps to snorkels. •	Anglesey Boat Company on Gallows Point. On your right as you travel into Beaumaris from Menai Bridge. •	Anglesey Arms Garage. Just off the Menai Suspension Bridge by the Hotel. •	Britannia Garage just off the next roundabout from the Suspension Bridge. If you arrive from the Britannia Bridge, then it is on the other side of the roundabout. •	Good little cafe/food stand in the car park just by the beach. Serves snacks and excellent ice-creams made here on Anglesey. Beaumaris: For food shopping and souvenirs. Menai Bridge – Shops and Co-op supermarket (now closed and soon to be a Waitrose. Yipee! Eating in Beaumaris is as good an experience as you want to make it. Although it is a borough town Beaumaris is small enough to walk around in about half an hour. There is a great chip shop in the archway halfway along the high street, Tea rooms and award winning hotel restaurants. •	The Olde Bull’s Head. Reasuringly expensive, but with an exquisite award winning menu. •	The Liverpool Arms - Highly regarded on Anglesey. •	The Buckley Hotel – This hotel has a pleasant old-fashioned feel to it. A number of elegant of bars and lounges. A wonderful setting for lunch, afternoon teas and dinner. If you’re lucky you may find yourself enjoying tea to the sound of a piano playing in the background. •	Bishopsgate Restaurant – At the end of the main street (Castle Street). •	Beau Tea Room – Castle Street. •	Sarah’s Coffee House – Turn up Church Street at the butchers and you'll find it opposite the Post Office. •	Court Restaurant - Just up the road from Sarah’s. •	The Anglesey Arms Hotel - Just off the Menai Suspension Bridge. •	The Menai Bridge Bar and Restaurant - Right on the bridge. The dining room is the large conservatory more or less on the bridge. •	A Taste of India Restaurant - This is an absolutely ‘must-visit’ restaurant. Tell Hussain or Ali that I sent you. Try their smaller restaurant in Holyhead if you're that end of the Anglesey. While your in Holyhead you can also call into have a kebab at East End Kebabs or Holyhead Spice run by friend Lutfur and his charming ever-smiling chef, Abdur. Not so straightforward. But it must be worthwhile, hence the beach's popularity. As you can see above, it's a long way down. But you'll love it. HONEST. •	Take the first left off at the end of the Britannia Bridge and head to the right for Menai Bridge. •	At the roundabout (Britannia Garage on your right) go straight across and down into the village square. Take a left for Beaumaris. •	Arrive in Beaumaris passing the petrol station on the outside of the village. •	Drive along Beaumaris’ main street (Castle Street). About halfway along take the left turning (Church Street) at Stanley butchers. This will take you toward Pentraeth (not signposted). •	Drive up the hill out of the town. At the very top of the hill take the right turning for Llanddona. •	Follow this road for just about three and a half miles until you arrive in the small village of Llanddona. •	The Owain Glyndwr pub is on your left. •	Take the left turning immediately after the pub and head down very steep roads to the beach. Either 25% or 35% steepness. Be very aware that you will inevitably encounter traffic coming uphill and soon learn that passing places are few and always in the incorrect places. 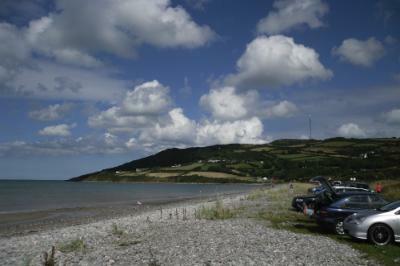 •	Arrive at the wide sweeping Llanddona Beach and treat yourself to a nice cup of tea. Keep your nerve on this lovely but narrow road and keep going. Concentrate, because there is a very good chance that the odd distracted Charley in his ‘Chelsea Tractor’ full of screaming kids may be heading directly for you. Please make sure you're not that Charlie ... or Charlotte. Second to excellent ice-cream, I love sandcastles and love building them. Sadly, I lack the architect's imagination to build big. I just step back now and then and decide where to add the next bit. My friend, Judith told me about a couple of engineers in Porth Dafarch (by Trearddur Bay) this year who built a three dimensional race track that even had a fly over ... over itself. Too much for me, though I can appreciate genius when I see. What's the best sandcastle that you ever built? Send me a photo if you've got one. What does a Sandcastle mean for you? Dreams? Treasured Memories? Peace and Quiet?